Home / Graphic card / Hardware / News / Nvidia / GeForce 680 card GK104 based picture? 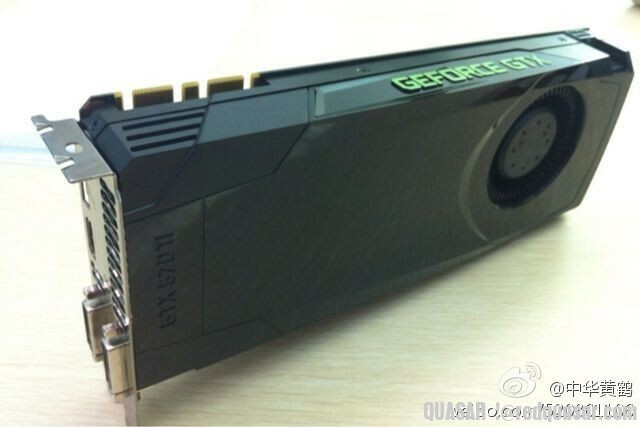 More unofficial information leak at RedQuasar BBS about Nvidia's Kepler GK104 based graphic card, the next generation from Nvidia featuring for the first time a 28nm node, this time its a picture of the GK104 graphic card which is supposed to be the next Geforce GTX 680 but the picture show a Geforce GTX 670 Ti label. Nvidia said lately that it will use a new designed logo for its new Geforce products, and the picture show a new Geforce GTX logo with a new font style, what we see is two SLI connectors, and out there you can zoom and see a 6+6 pin PCIe power connectors zone. The GK104 based graphic card or let's say the Geforce GTX670 Ti which is close to be a successor of the current GTX 560 Ti, is expected to be released this month, about the specification of the GK104, rumors said that it will use a new architecture, packing 1536 shaders, 128 TMU, 32 ROP and 2 GB memory GDDR5 using a 256-bit bus, Core clock is expected to be around 950 MHz, we suggest that the price will be between 250-350$, that's all, no more information at the moment.